Are you ready? 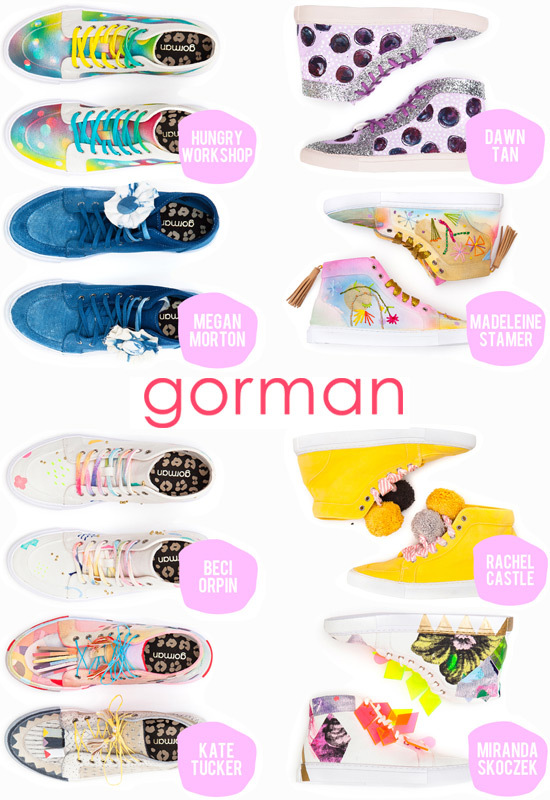 The fabulous folks at Gorman are auctioning 21 Adventure Sneakers personalised by some of my favourite artists, designers, and creatives including Aussies Miranda Skoczek, Beci Orpin, Madeleine Stamer, Rachel Castle Kat McLeod, Dawn Tan, Ellie Malin, Hungry Workshop, Marsha Golemac, Kate Tucker, Megan Morton, and more. How can you even choose? The customised sneakers will be auctioned to raise money for kid's art therapy school, Little Seeds Big Trees. In addition, Gorman will be chipping in $20 from each sale of the standard Adventure Sneakers. You can bid on your favourite sneaker on the Gorman eBay page until 7th June 2013. How wonderful that all those creatives have spent time and effort to create these amazing wearable art pieces for kids art therapy. Head to Gorman to start bidding. Good luck! And let me know if you score one of the sneakers!